the western Indian Ocean islands of Madagascar, Mauritius, and Reunion each have one endemic Coracina species. 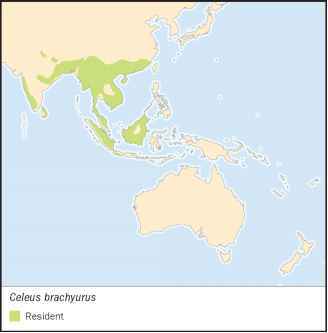 The remaining 34 Coracina species are distributed through the Oriental and Australasian regions. 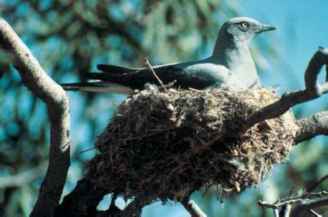 Twenty-four species occur only in Australasia, where several species have very restricted island distributions. The ground cuckoo-shrike (Pteropodocys maxima) is endemic to Australia. Of the other monospecific genera, the golden cuckoo-shrike (Campochaera sloetii) is endemic to New Guinea, and the black-breasted triller (Chlamydochaera jeffreyi) to Borneo. The genus Lalage is predominantly Australasian in distribution. Only three of its nine species occur in the Oriental region, while two species inhabit Pacific islands east of Western Samoa. The remaining three genera (Hemipus, Tephrodornis, and Pericrocotus) are predominantly birds of southern and Southeast Asia. The 11 minivet species are widely distributed in southern Asia. The rosy minivet (Pericrocotus roseus) and the long-tailed minivet (Pericrocotus ethologus) occur as far west as eastern Afghanistan, and the ashy minivet (Pericrocotus divar-icatus) ranges east to eastern Siberia and Japan.